Fresh from tackling the Col de Joux Plane, in the French Alps, our Director, Zoë Westerman, headed North yesterday to the foot of the Berwyn Mountain range. 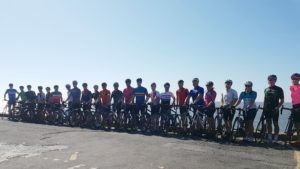 Joining the professional road cycling team, Madison Genesis, first up was a spot of lunch with the team and a talk from Tim Lawson, former European Champion Track Cyclist and former Cyclone24 participant. Tim is a sports nutrition supremo, and a pretty familiar name in the cycling industry, so it was great to hear from him and get our hands on some of the latest Stealth products. With the rain pouring down, a typically miserable Welsh July day, Zoë and the Madison Genesis Team headed off on a 60km ride out around the stunningly beautiful Lake Vyrnwy. A hilly but beautiful route, with some great scenery…..if only the sun had been shining hey! On the ride there was much talk of the recent Velothon Wales, after Conor Swift came tantalisingly close to contesting victory, finishing 7th in the UCI race and despite the rain and the hill climbs, there was still time to get some great insights from the team about their training and of course their thoughts on Cylcone24! Many thanks to Madison Genesis for a great day out in the Welsh Hills.